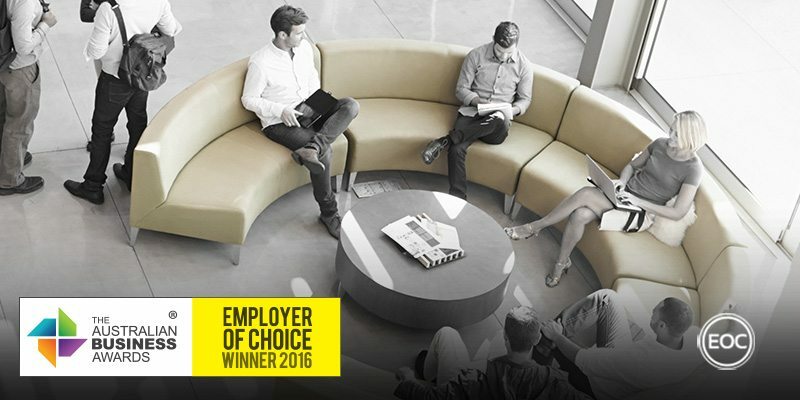 JCurve Solutions has been recognised as an Employer of Choice in The Australian Business Awards 2016. JCurve Solutions is a small market cap Australian listed technology company with a core focus on delivering leading cloud software solutions to help clients to run their businesses more efficiently, with less complexity. Focusing on an open, supportive, values-driven culture that creates exceptional results for its clients, JCurve have recently moved into a new office as part of an investment in its people. JCurve Solutions understands that the employees and culture are the driving force in providing the company’s real competitive advantage in the market place. Despite being a small team, they’ve strived to achieve fantastic results in culture, leadership and strategy. Over the past 12 months the company has invested significantly in these aspects, including training and development alongside the implementation of better talent acquisition, internal communications and engagement action plans. Additionally, the appointment of HR consultants, responsible for the review and rollout of new HR policies has resulted in a smooth transition and induction process for new employees. To support the company’s focus to acquire and retain talented employees, there is an internal emphasis on providing staff at all levels with continued training and professional development opportunities. In recognition of this, JCurve implements a multi-level approach to staff development which integrates on the job and formal training courses, peer-to-peer mentoring and brown bag “lunch and learn” sessions for open knowledge sharing and product training. Through annual Professional Development Planning (PDP) reviews, Key Performance Indicators (KPIs) are set for individual staff members in alignment with corporate objectives while also providing an opportunity to ensure all staff are equipped with the necessary skills and tools to efficiently and effectively manage their role. If gaps are recognised, training is organised to fulfil the gap. Employee recognition is also an integral element of JCurve’s culture and values program. Staff are encouraged to live the company values through every aspect of their work-life and nominate peers who they witness going above and beyond to deliver on the values. Staff are recognised and thanked for their continued dedication to JCurve and the company’s goals and objectives through bi-annual Company Days. Additionally, JCurve Solutions strives to embody a wholesome approach to employee welfare, driven by the attitude that happy, healthy and intellectually fulfilled staff will be efficient and productive workers. The company has health and safety policies and ensures these are adhered to with HR consultant oversight. Each quarter the executive team reviews the policies and creates a detailed action plan of initiatives to improve how JCurve Solutions supports its staff.